The king mattress bag will hold any king-sized mattress or two twin mattresses. Mattress bags are ideal for preventing damage from your mattress during the process of moving. When in our bag, your king mattress will remain clean and whole, not becoming dirty from the vehicle, any surrounding objects, or seasonal elements, and also not becoming torn open by any sharp edges. Not to mention, the mattress bag helps keep the springs in your mattress safe should the mattress be dropped, fall over, or experience any kind of harsh impact. If you do not have Moving Ahead Services handle your move, then be sure to exercise caution when loading or unloading your mattress, as it would be easy to drop a mattress and hurt yourself. However, the mattress bags can also make carrying your mattress easier by giving you more to grip. We do recommend that you allow us to handle your move and your mattress because our movers have been professionally trained on the safest means of lifting and carrying king-sized mattresses, and they can make sure that your mattress is not dropped. Our movers can also load the mattress more effectively so that it is in a secure position that will not make itself or your other belongings more vulnerable to damage. 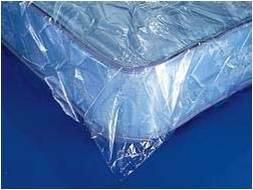 Many customers take advantage of our mattress bags because they are so well priced and because they offer your mattress strong protection throughout the move, shielding it from all possible sources of damage. You can always consult with our capable customer service crew about whether or not you should purchase mattress bags or any of our other supplies and they will give you their best insight. With our king mattress bag, your king-sized mattress or your two twin mattresses will still offer you a sound spot to sleep when you arrive at your new home.